I just found a little program called CintaNotes via LifeHacker. 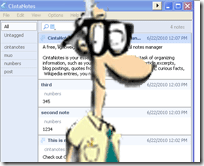 I have been using my notes application on my Windows Mobile device as well as in Outlook for some close to 10 years now. My life has changed drastically over this time period and now I have the need to sync and share my notes with my significant other as well as have access to updated notes where ever I am. 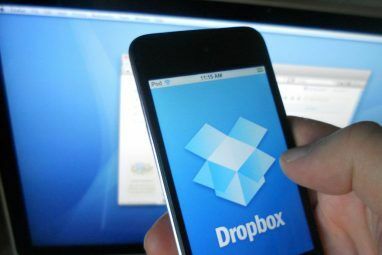 Using a combination of CintaNotes and DropBox DropBox: Review, Invites, and 7 Questions With the Founder DropBox: Review, Invites, and 7 Questions With the Founder Read More , all my expectations have been realized. I started by downloading this small 890 KB file from here. The application can be installed locally or to a USB drive. That’s right – it can be used as a portable app! The trick to getting it to sync using DropBox is to install it to a shared DropBox folder. This way the changes will be written back and forth as my wife or I change or add notes. CintaNotes is made so that the application does not need to be closed to copy or overwrite the data file. This means notes from my wife’s machine will show up as soon as DropBox syncs the folder. Let’s take a look at how it works. When we first run the application we will see an error message about a configuration file missing. This is normal, click OK and we can begin. When we first arrive inside the application our note book will be empty like you see in the screen shot above. Now to get data into the application we can either create a new note or select some text and launch our hot key to create a new note out of it. 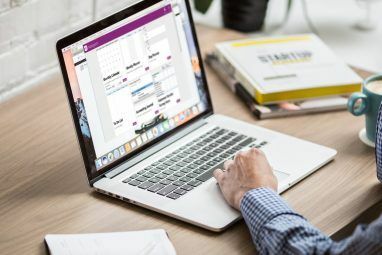 You can add your notes in the body of the note and you can also add tags (which are searchable) as well as the link to the data you are referring to. I created a few notes as you can see below, so that I can highlight searching by data in the note, tags or URLs. Your notes appear in chronological order by default. You can hit the date drop-down menu to change it to sort by another field. As I start typing, CintaNotes filters out items that do not match my criteria. I started typing in the word second and immediatley CintaNotes showed me the correct note. You can hit Escape to cancel. Now we are on the configure hot keys screen. The hot key that we will want to set up is the first one. It is called the clip text hot key. Highlight the field and hit the key that you want to use to activate your clipping function. You can configure the show main CintaNotes window and add new note hot keys as well. Try and use key combinations that are not in use by other applications. The feature that we loved the most was not really mentioned in the help files or online. If you add the folders of two separate CintaNote installations (or where your data lives) to DropBox on both machines, as soon as a user adds or modifies a note, the changes will automatically be synced! The developers modified the application so you do not need to shut down the application to overwrite your data file or copy it. Very nice work guys! 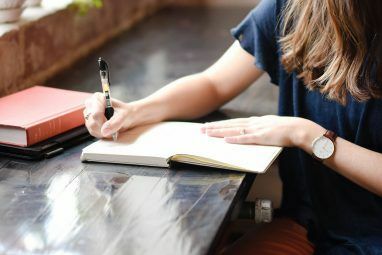 And if you are looking for other ways to take quick and easy notes, check out this post here 5 Great Multi-Platform Tools to Take Quick Notes Anywhere 5 Great Multi-Platform Tools to Take Quick Notes Anywhere Read More . Explore more about: Dropbox, Note-Taking Apps, Portable App. Even better is Tomboy Notes, you can sync to a folder in dropbox and use Tomboys in windows AND linux. And it does looks like a note taking application, not like cintanotes. Actually CintaNotes help describes how to properly setup the DropBox sync here: [Broken Link Removed] In short, don't place entire CintaNotes folder into DropBox folder, place just the data file in there. In short, don't place entire CintaNotes folder into DropBox folder, place just the data file in there.